Daily high temperatures decrease by 5°F, from 52°F to 47°F, rarely falling below 41°F or exceeding 57°F. Daily low temperatures decrease by 4°F, from 43°F to 39°F, rarely falling below 32°F or exceeding 49°F. For reference, on July 27, the hottest day of the year, temperatures in Claremorris typically range from 54°F to 65°F, while on January 15, the coldest day of the year, they range from 37°F to 45°F. The daily average high (red line) and low (blue line) temperature, with 25th to 75th and 10th to 90th percentile bands. The thin dotted lines are the corresponding average perceived temperatures. The figure below shows you a compact characterization of the hourly average temperatures for the quarter of the year centered on November. The horizontal axis is the day, the vertical axis is the hour of the day, and the color is the average temperature for that hour and day. The average hourly temperature, color coded into bands. The shaded overlays indicate night and civil twilight. Victoria, Canada (4,415 miles away) is the far-away foreign place with temperatures most similar to Claremorris (view comparison). The month of November in Claremorris experiences essentially constant cloud cover, with the percentage of time that the sky is overcast or mostly cloudy remaining about 69% throughout the month. The clearest day of the month is November 1, with clear, mostly clear, or partly cloudy conditions 33% of the time. For reference, on December 21, the cloudiest day of the year, the chance of overcast or mostly cloudy conditions is 72%, while on July 11, the clearest day of the year, the chance of clear, mostly clear, or partly cloudy skies is 47%. The percentage of time spent in each cloud cover band, categorized by the percentage of the sky covered by clouds. A wet day is one with at least 0.04 inches of liquid or liquid-equivalent precipitation. In Claremorris, the chance of a wet day over the course of November is gradually decreasing, starting the month at 47% and ending it at 44%. For reference, the year's highest daily chance of a wet day is 52% on January 3, and its lowest chance is 32% on April 22. The percentage of days in which various types of precipitation are observed, excluding trace quantities: rain alone, snow alone, and mixed (both rain and snow fell in the same day). To show variation within the month and not just the monthly total, we show the rainfall accumulated over a sliding 31-day period centered around each day. The average sliding 31-day rainfall during November in Claremorris is essentially constant, remaining about 3.8 inches throughout, and rarely exceeding 6.2 inches or falling below 1.6 inches. The average rainfall (solid line) accumulated over the course of a sliding 31-day period centered on the day in question, with 25th to 75th and 10th to 90th percentile bands. The thin dotted line is the corresponding average liquid-equivalent snowfall. Over the course of November in Claremorris, the length of the day is rapidly decreasing. From the start to the end of the month, the length of the day decreases by 1 hour, 36 minutes, implying an average daily decrease of 3 minutes, 18 seconds, and weekly decrease of 23 minutes, 4 seconds. The shortest day of the month is November 30, with 7 hours, 53 minutes of daylight and the longest day is November 1, with 9 hours, 28 minutes of daylight. The number of hours during which the Sun is visible (black line). From bottom (most yellow) to top (most gray), the color bands indicate: full daylight, twilight (civil, nautical, and astronomical), and full night. The earliest sunrise of the month in Claremorris is 7:35 AM on November 1 and the latest sunrise is 53 minutes later at 8:27 AM on November 30. The latest sunset is 5:03 PM on November 1 and the earliest sunset is 43 minutes earlier at 4:20 PM on November 30. Daylight saving time is observed in Claremorris during 2019, but it neither starts nor ends during November, so the entire month is in standard time. For reference, on June 21, the longest day of the year, the Sun rises at 5:05 AM and sets 17 hours, 5 minutes later, at 10:10 PM, while on December 22, the shortest day of the year, it rises at 8:51 AM and sets 7 hours, 26 minutes later, at 4:17 PM. The solar day over the course of November. From bottom to top, the black lines are the previous solar midnight, sunrise, solar noon, sunset, and the next solar midnight. The day, twilights (civil, nautical, and astronomical), and night are indicated by the color bands from yellow to gray. We base the humidity comfort level on the dew point, as it determines whether perspiration will evaporate from the skin, thereby cooling the body. Lower dew points feel drier and higher dew points feel more humid. Unlike temperature, which typically varies significantly between night and day, dew point tends to change more slowly, so while the temperature may drop at night, a muggy day is typically followed by a muggy night. The chance that a given day will be muggy in Claremorris is essentially constant during November, remaining around 0% throughout. For reference, on July 24, the muggiest day of the year, there are muggy conditions 0% of the time, while on January 1, the least muggy day of the year, there are muggy conditions 0% of the time. The percentage of time spent at various humidity comfort levels, categorized by dew point. This section discusses the wide-area hourly average wind vector (speed and direction) at 10 meters above the ground. The wind experienced at any given location is highly dependent on local topography and other factors, and instantaneous wind speed and direction vary more widely than hourly averages. The average hourly wind speed in Claremorris is essentially constant during November, remaining within 0.1 miles per hour of 13.3 miles per hour throughout. For reference, on January 3, the windiest day of the year, the daily average wind speed is 15.2 miles per hour, while on July 26, the calmest day of the year, the daily average wind speed is 11.0 miles per hour. The average of mean hourly wind speeds (dark gray line), with 25th to 75th and 10th to 90th percentile bands. The hourly average wind direction in Claremorris throughout November is predominantly from the west, with a peak proportion of 38% on November 5. The percentage of hours in which the mean wind direction is from each of the four cardinal wind directions, excluding hours in which the mean wind speed is less than 1.0 mph. The lightly tinted areas at the boundaries are the percentage of hours spent in the implied intermediate directions (northeast, southeast, southwest, and northwest). Claremorris is located near a large body of water (e.g., ocean, sea, or large lake). This section reports on the wide-area average surface temperature of that water. The average surface water temperature in Claremorris is gradually decreasing during November, falling by 3°F, from 54°F to 52°F, over the course of the month. The daily average water temperature (purple line), with 25th to 75th and 10th to 90th percentile bands. Definitions of the growing season vary throughout the world, but for the purposes of this report, we define it as the longest continuous period of non-freezing temperatures (≥ 32°F) in the year (the calendar year in the Northern Hemisphere, or from July 1 until June 30 in the Southern Hemisphere). The growing season in Claremorris typically lasts for 8.6 months (263 days), from around March 13 to around December 1, rarely starting before February 2 or after April 15, and rarely ending before October 23 or after January 5. The month of November in Claremorris is very likely fully within the growing season, with the chance that a given day is in the growing season rapidly decreasing from 82% to 51% over the course of the month. The percentage of time spent in various temperature bands. The black line is the percentage chance that a given day is within the growing season. Growing degree days are a measure of yearly heat accumulation used to predict plant and animal development, and defined as the integral of warmth above a base temperature, discarding any excess above a maximum temperature. In this report, we use a base of 50°F and a cap of 86°F. The average accumulated growing degree days in Claremorris are essentially constant during November, remaining within 9°F of 1,107°F throughout. The average growing degree days accumulated over the course of November, with 25th to 75th and 10th to 90th percentile bands. This section discusses the total daily incident shortwave solar energy reaching the surface of the ground over a wide area, taking full account of seasonal variations in the length of the day, the elevation of the Sun above the horizon, and absorption by clouds and other atmospheric constituents. Shortwave radiation includes visible light and ultraviolet radiation. The average daily incident shortwave solar energy in Claremorris is gradually decreasing during November, falling by 0.6 kWh, from 1.2 kWh to 0.6 kWh, over the course of the month. The average daily shortwave solar energy reaching the ground per square meter (orange line), with 25th to 75th and 10th to 90th percentile bands. For the purposes of this report, the geographical coordinates of Claremorris are 53.717 deg latitude, -9.000 deg longitude, and 210 ft elevation. The topography within 2 miles of Claremorris contains only modest variations in elevation, with a maximum elevation change of 157 feet and an average elevation above sea level of 220 feet. Within 10 miles contains only modest variations in elevation (774 feet). Within 50 miles contains significant variations in elevation (2,641 feet). The area within 2 miles of Claremorris is covered by grassland (39%), cropland (22%), trees (22%), and artificial surfaces (12%), within 10 miles by grassland (50%) and cropland (21%), and within 50 miles by grassland (35%) and herbaceous vegetation (22%). This report illustrates the typical weather in Claremorris year round, based on a statistical analysis of historical hourly weather reports and model reconstructions from January 1, 1980 to December 31, 2016. There are 2 weather stations near enough to contribute to our estimation of the temperature and dew point in Claremorris. For each station, the records are corrected for the elevation difference between that station and Claremorris according to the International Standard Atmosphere , and by the relative change present in the MERRA-2 satellite-era reanalysis between the two locations. The estimated value at Claremorris is computed as the weighted average of the individual contributions from each station, with weights proportional to the inverse of the distance between Claremorris and a given station. 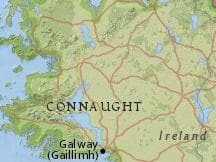 The stations contributing to this reconstruction are: Ireland West Airport Knock (89%, 25 kilometers, northeast) and Shannon Airport (11%, 113 kilometers, south). All data relating to the Sun's position (e.g., sunrise and sunset) are computed using astronomical formulas from the book, Astronomical Tables of the Sun, Moon and Planets , by Jean Meeus. All other weather data, including cloud cover, precipitation, wind speed and direction, and solar flux, come from NASA's MERRA-2 Modern-Era Retrospective Analysis . This reanalysis combines a variety of wide-area measurements in a state-of-the-art global meteorological model to reconstruct the hourly history of weather throughout the world on a 50-kilometer grid. Land Use data comes from the Global Land Cover SHARE database , published by the Food and Agriculture Organization of the United Nations. Elevation data comes from the Shuttle Radar Topography Mission (SRTM) , published by NASA's Jet Propulsion Laboratory. Names, locations, and time zones of places and some airports come from the GeoNames Geographical Database . Time zones for aiports and weather stations are provided by AskGeo.com . Maps are © Esri, with data from National Geographic, Esri, DeLorme, NAVTEQ, UNEP-WCMC, USGS, NASA, ESA, METI, NRCAN, GEBCO, NOAA, and iPC. The information on this site is provided as is, without any assurances as to its accuracy or suitability for any purpose. Weather data is prone to errors, outages, and other defects. We assume no responsibility for any decisions made on the basis of the content presented on this site. We draw particular cautious attention to our reliance on the MERRA-2 model-based reconstructions for a number of important data series. While having the tremendous advantages of temporal and spatial completeness, these reconstructions: (1) are based on computer models that may have model-based errors, (2) are coarsely sampled on a 50 km grid and are therefore unable to reconstruct the local variations of many microclimates, and (3) have particular difficulty with the weather in some coastal areas, especially small islands. We further caution that our travel scores are only as good as the data that underpin them, that weather conditions at any given location and time are unpredictable and variable, and that the definition of the scores reflects a particular set of preferences that may not agree with those of any particular reader. Interactive Map » © Esri, et al.